In my constant search for new and interesting testing tools I recently came across WAPT, which claims to be one of the best load, stress and performance testing tool for websites and web-based applications, and unlike most other similar vendors WAPT surprisingly delivers its promise in most areas. One thing that I really like about using WAPT is its unmatched simplicity. Unlike many other widely used load and stress testing tools that you might have already used, WAPT uses a fully customizable set of virtual users to simulate a real-life load. 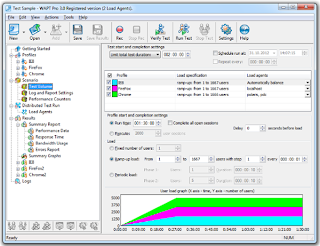 And to make things even more interesting, with WAPT, your test scenarios can be detailed up to unique parameters for each individual user. What makes WAPT a Good Tool for Any Web Application Load, Stress, Performance Tester? WAPT is designed to generate maximum possible load on your web site that you are testing. While most other similar tools also offer this ability, what makes WAPT impressive is its ability to use a number of techniques to make this load as similar as possible to the activity of real users browsing the web site in real life. This unique approach ensures that if your tests are passed, you can safely assume that the web site under test will show similar performance characteristics in real-time usage. They have 2 product types to select form: WAPT and WAPT Pro. Both of these products comes with free 30 days trial packs during which period you're allowed to ramp up to 20 virtual users. But once you are satisfied and purchase either of the products, you can generate thousands of real-like virtual users to put load on your web site and web applications. The regular version of WAPT works as a single application that delivers test design and load generation features. Tests can be recorded using any desktop or mobile browser. Your test design and optimization can be done using their user-friendly product GUI and you run test scenarios with up to approximately 2,000 concurrent virtual users. Your web site under test can run under any OS, including all UNIX and Windows platforms. Also, your web application can be implemented using any web technology and can have a distributed architecture consisting of multiple web servers and database servers. All you need is a web interface through which WAPT can simulate the activity of real site visitors. 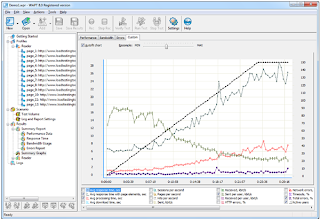 Besides the regular functionality of the normal version WAPT Pro has some extra benefits for serious load testing professionals. If you require performing periodic load testing at different geographic locations, or if you run cloud-based tests, create high web site load, receive detailed information on the server performance or have more flexibility in processing web site responses, WAPT Pro is probably the best choice for you. WAPT Pro can also measure different parameters of your web server's performance, thus letting you see how your web application responds to the increasing load in terms of CPU, Memory (RAM) or network usage. In addition, you can collect various database performance data for MS SQL, Oracle, or any other database that can be accessed through ODBC. This data is presented in the test results along with other parameters. - I like the way WAPT lets you simulate thousands of virtual users on your website and its ability to test various user interactions. - I like the way WAPT tries to emulate real user interactions and try to make its virtual users perform near real life user interactions. - WAPT also allows for in-depth reporting that can be viewed in both HTML and Excel formats. - The ability to generate load quickly, without the need to wait a long time before your thousands of virtual users are ready. - The way, WAPT provides automatic handling of standard session data and a number of functions to work with application-specific values. And it spports of all types of proxy servers: HTTP(S), SOCKS4(5) etc. - The support for SSL enabled web site load testing. - Advanced error reporting that is backed up by an integrated log-viewer. - JS (Java Script) supported server response processing that can be extended to 64 bit load engine. - Though you can test any website running any OS and technology, you cannot install WAPT in any other OS other than Windows. In today's environment where most of the web sites and web applications are run on Linux based environments this is a big setback. - If you are a fan of scripting and like to write and edit your tests, then here is bad news! WAPT doesn't allow for scripting and rather uses Record > Configure > Verify > Execute > Analyze workflow. - WAPT is not a load testing tool that can be termed as inexpensive. Even the regular version of WAPT costs $700 and the advance version WAPT Pro costs $1200. However, if you are into some serious load, stress and performance testing then you may find this price justified for the extensive and unique capabilities that this tool delivers. Load testing doesn't have to be limited to the only large corporate development infrastructures because of cost and people power constraints. Overall, WAPT is a a relatively affordable, easy-to-use load, stress and performance testing tool that can help you poke holes in your developer's code and if you are like me and enjoy bringing your web application under test to its knees then you are going to enjoy using WAPT! I really enjoyed reading your blog. It was a very good writer, and easy to undertand. Unlike additional blogs I have read really not tht good. I'm also very interested in your posts. In fact, after reading, I had to go to show that he is my friend and he ejoyed it as well! "- Though you can test any website running any OS and technology, you cannot install WAPT in any other OS other than Windows. In today's environment where most of the web sites and web applications are run on Linux based environments this is a big setback. - WAPT is not a load testing tool that can be termed as inexpensive. Even the regular version of WAPT costs $700 and the advance version WAPT Pro costs $1200. However, if you are into some serious load, stress and performance testing then you may find this price justified for the extensive and unique capabilities that this tool delivers." And that's why I prefer Jmeter better than any other tool. But it's(JMeter's) main disadvantage is that it cannot give more than 600 of users from one machine and its reporting out-of-box capabilities are not good. The only solution, that I know to overcome this is using performance testing cloud. What is the point of running a load test with browsers? the point of load testing is to measure the server metrics.